There’s an alternate universe in which a band called The National have just released a new album called Trouble Will Never Find Me. It’s full of stadium-friendly guitar riffs and Olympic-sized drumming. At summer festivals in that alternate universe The National always get top billing and some otherwise very serious young men go totally nuts whenever they perform. 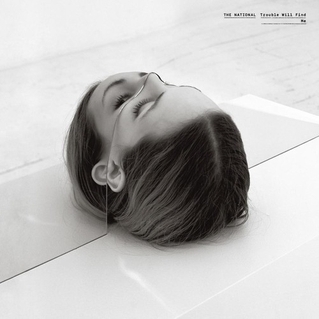 In our universe, by contrast, The National have just released an album called Trouble Will Find Me. It’s a totally different world. Whereas you might expect the opening track, ‘I Should Live In Salt’, to be altogether anthemic, the pace is measured, the mood downbeat. This is a very deliberate statement. The National are saying that if they have to be likened to R.E.M., then they’re going to be the R.E.M. of Murmur not Out Of Time. For sure, ‘Sea Of Love’, ‘Humiliation’, and ‘Graceless’ up the pace, but there are precious few, if any, stadium-sized hooks and only ‘Pink Rabbits’ with its lovely piano-driven melody comes anywhere close to being jaunty. Refreshingly, this is a set of songs where you have to do the listening work. And, like pretty much every exercise of that sort, there are rewards. ‘Slipped’ could be just another doleful little song, but wait for the the chorus and it turns out to be quite delicate. ‘I Need My Girl’ keeps wanting to take off, but is kept nicely in check. With Trouble Will Find Me, The National have done little to dispel their largely self-inflicted tortured artist effect. As a consequence, up and down the land lots of very serious young men are listening to this album very carefully, dissecting the lyrics and waiting for that festival where The National are headlining and where they can go totally nuts for an hour or two at least. More power to them. If Wampire took themselves seriously, then they could conquer the world. Or at least that part of the world where indie-labeled, organ-led, guitar-backed songs rule. Let’s take the band name. Wampire? What demographic is that trying to appeal to? Lovers of the blood-sucking undead with a speech defect? And then there’s the album cover. Choosing a silly band name is one thing, but blatantly drawing attention to it is another. So, the bottom line is that if Wampire can’t themselves seriously, then we shouldn’t either, right? Wrong! This is a great album. Produced by Jacob Portrait of Unknown Mortal Orchestra, Wampire are fishing in the same pond as luminaries such as Tame Impala, Foxygen, Ariel Pink, and UMO themselves. The pond isn’t deep, but at the moment it’s teeming with life. And, like their counterparts, Wampire are landing some fine catches. One of things that makes the album work is that the playfulness pretty much ends with the name and the cover. The first few seconds of ‘The Hearse’ are deliberately over-the-top mock gothic and then there’s the cheesy rhyming of words like ‘insay-yane’ on ‘Trains’. But, there are no unlistenable sonic experiments that sound good in theory but bad in practice, or ‘Maxwell’s Silver Hammer’-like pastiches that are both bad in theory and in practice. Instead, there are just some fine songs. ‘Orchards’ and ‘Spirit Forest’ are totally hummable. ‘I Can’t See Why’ is full of energy. And what’s nice is that Wampire are not afraid to mix things up in the song. ‘The Hearse’ starts off as great rhythmic number, only to slow down and then build up again to a great finish. ‘Giants’ is the heaviest track, but it too changes pace nicely. At about 33 minutes, though, this is a pretty slight album. And ‘Snacks’, the penultimate track, is an instrumental and sounds like a B-side if there were B-sides any more. That said, it’s good just to hear Wampire at their newest and most excited. Next time, though, think about the cover. This is a magnificent album. A collaboration between Sun Kil Moon and The Album Leaf, both elements combine perfectly. Jimmy LaValle of The Album Leaf provides the backing. Mainly electronic including the drum beat, it’s pretty minimal. Crucially, it’s never in competition for the song. With guitars on only a couple of tracks, LaValle sets the basic foundation throughout. Mark Kozelek of Sun Kil Moon gives us the vocals and the lyrics. Along with Willy Vlautin of Richmond Fontaine, Mark Kozelek is about the best story teller around. What’s more, they seem to be his stories. Told in the first person, they seem utterly authentic. ‘Gustavo’ has a Vlautin-like theme with the acutely observed story-line details. But it’s Mark’s house that Gustavo is renovating and it’s Mark who fails to help when Gustavo gets deported. At least three songs tell us directly about his touring experiences. The flights, the hotels, the ceiling gazing. Is it miserable? Well, it’s Mark Kozelek. So, you’d expect it to be. Twice we’re told that touring is lonely and more than once we’re told about people who’ve died. But that’s not the feeling you come away with. There’s sarcasm. “My guitar was broken and in need of repair, Thanks for the hassles Korean Airways”. And irony. Visiting Australia, he tells us “It rained all the evening and it rained all the day, Never got to see the outback or visit Bon Scott’s grave”. But mainly there’s plenty of hope and love. “I’m so happy to be alive”, he sings, “To have these people in my life”. And then there’s the 10-minute closer. After wistful tales of tragic deaths, he ends with a description of him sitting in a plane looking down on San Francisco about to come home from another long tour. “And at The Golden Gate and Oakland Bay Bridges many boats are sailing, And the wonder of life always prevails”. At 78 minutes, this is still a lean album. The work of Jimmy LaValle ensures that. But most of all it’s a 78-minute glimpse into what makes us human and how we react to the human condition. Wonderful.